I believe Dad started out as a clerk as he felt it was a way to get into the air force. He was quite young enlisting, and only wanted to be a pilot, so he took any job he could to ensure he was close to the decision makers. 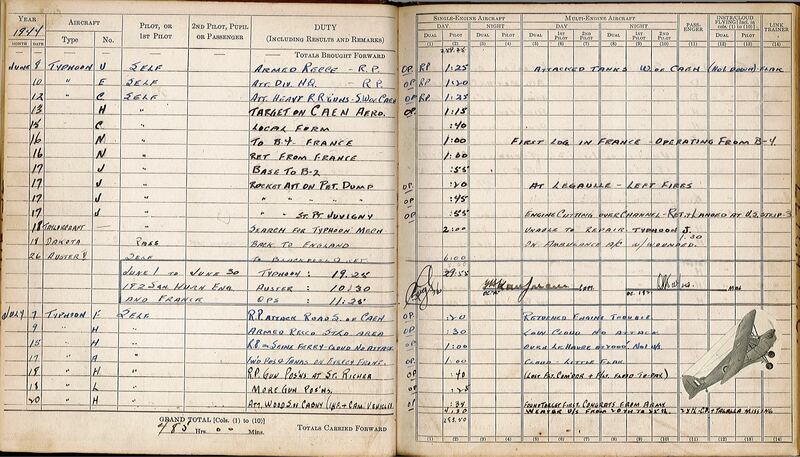 Our father was shot down over France, captured by the Germans and escaped from his capturers. He was part of the 439 Squadron. Sadly, our father died 3 years ago, so it will be special to have his story told. Background: Born March 5, 1920 in Orillia, Ontario, where I lived until joining the RCAF in September 1940. Worked as a clerk in Ucluelet, BC, Claresholm, Alberta and Bella Bella, BC. 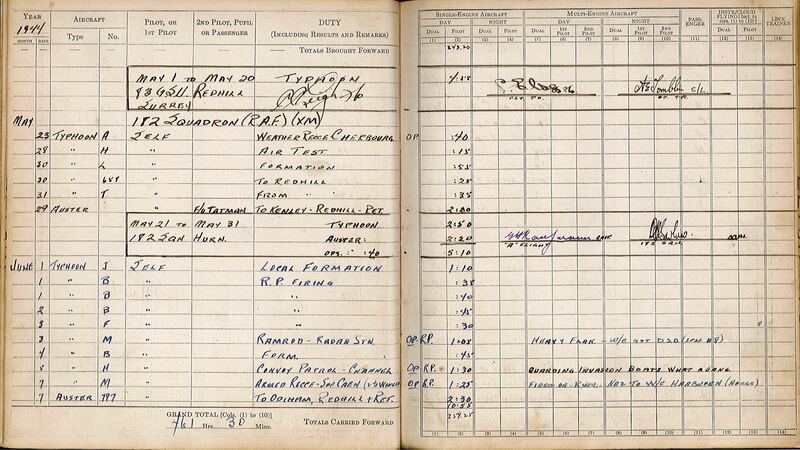 Service Record: RCAF J22279 Remustered air crew and graduated as pilot at Claresholm, Alberta, December 24, 1942. Commissioned and posted to 123 Army Cooperation Squadron Debert, Nova Scotia, studying and creating tactics for close support to army, flying Harvards, Ansons, Lysanders, Hurricanes and Bolingbrokes. Squadron was posted to England and became 439 Squadron, Typhoons, January 1944. I left 439 Squadron for more training at 83 GSU, Redhill, and thence in May to 182 RAF rocket Tiffy Squadron attacking ground target gun positions, trucks, tanks, etc. from Hurn and then from strip in France. Had to force land twice on Beachhead. Shot Down: On 37th sortie, I was attacking too low, was hit, probably by my own rocket burst. Losing coolant, quick decision to crash land rather than to get high enough to jump. Made good belly landing in field. 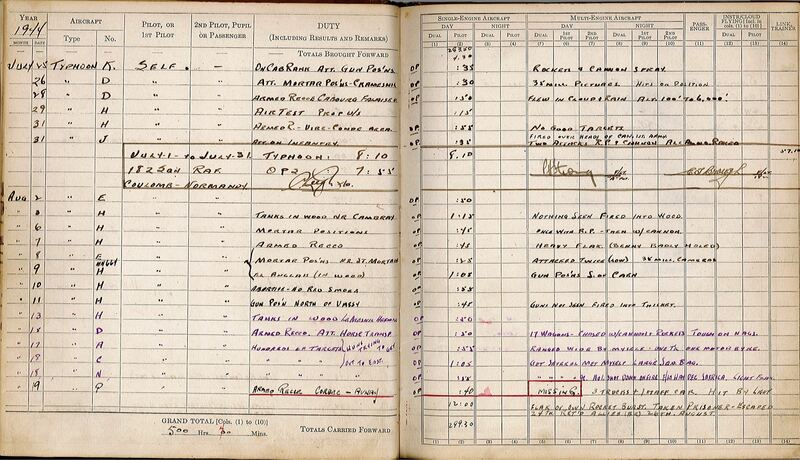 Details of Escape (August 1944): I quickly realized that I was between the lines. (Shells were going overhead, but nothing moving on the ground.) I hid in a river briefly then came out to try to get to our troops but was intercepted by Germans who had watched me land. I was sent back under guard and eventually joined a group of about 20 or so mixed prisoners. I promised an American T-Bolt pilot and an English tank driver we would not cross the Seine River. We took off one rainy night and after some hours, sheltered in the loft of a shed, which we found in the morning, we had shared with German troops! From The Evaders by Emerson Lavender and Norman Sheffe: The guards had herded us together and formed a ring around us while one of the NCO’s went off to find a building to stick us in. It was very dark and the rain was heavy enough that visibility was very poor. I whispered to the other two guys to back up very slowly and ease our way back through the circle of guards until we could drop into a ditch. Hopefully, they would not know we were gone until morning. The three stole away in the darkness undetected and were soon making time on gravel roads. When they left, we moved back and met a British Recce patrol. I made my way back to the squadron, but CO would not put me back on operations and returned me to England where I was posted to Thirsk, Yorkshire as OC, a fighter affiliation flight, working with No. 6 Bomb Group, flying Spitfires during the day and Hurricanes at night. I was sent back to Canada to a short stint as S. Ad. O., Camp Borden, then to 124 Ferry Squadron, Rockcliffe, Ontario, from January to March 1946, where I took my discharge. 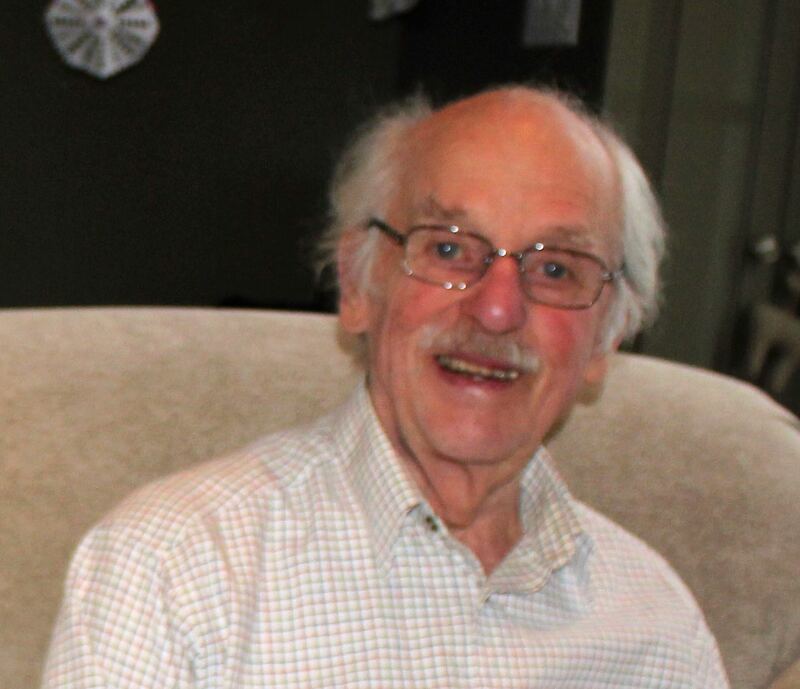 LEIGH, Clayton Currie - March 5, 1920 - April 7, 2015 It is with sadness, but also in celebration of a long, healthy and well lived life, that we announce the peaceful passing on Tuesday, April 7, 2015 of Clayton Leigh of Hillsburgh. Beloved husband of Jane for 59 years. Loving father of Stephanie, Adam (Lori-Ann) and Rebecca (Chris). Cherished grandfather of Flora, Addison, Selah, Alexa and Sara. Great-grandfather of Quinn. Survived by his sister Glenna and predeceased by Audrey. 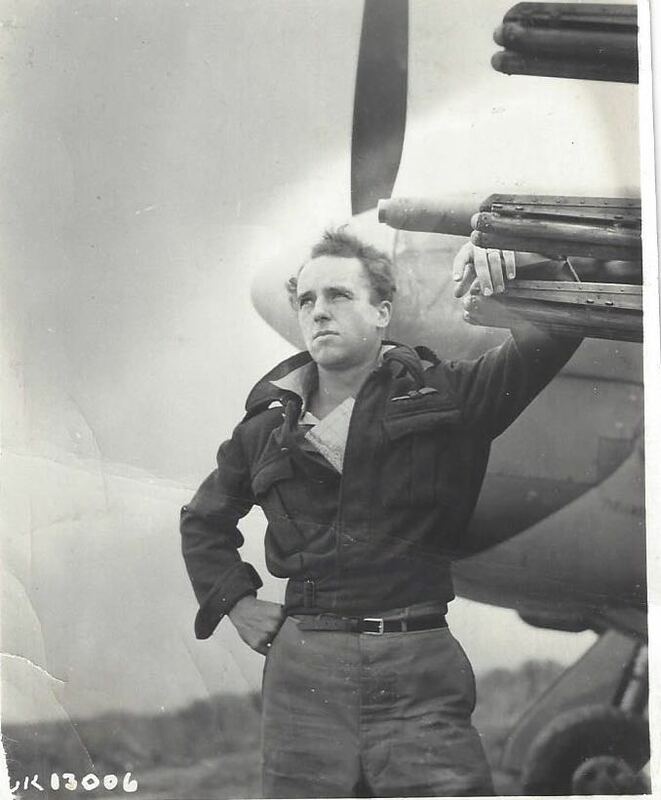 Born in Orillia, Clayton proudly served as a Typhoon Pilot in WWII, returned to Canada and pursued a successful career in Real Estate. An avid traveller, active community member, sportsman and gentleman, Clayton will be sadly missed by his extended family and many friends.